IMO sulfur regulations will constrain large tanker supply growth while an ageing fleet should encourage scrapping, writes Tim Smith, director of tanker and energy markets at MSI. Despite the tumultuous environment in both major bulk shipping markets, MSI’s forward views in the tanker sector have been consistent; broadly speaking our one-year timecharter rate benchmark forecasts are tracking the market. Chart 1 shows MSI’s one-year T/C rate forecast for an uncoated Aframax as predicted in Q1 of the last five years. 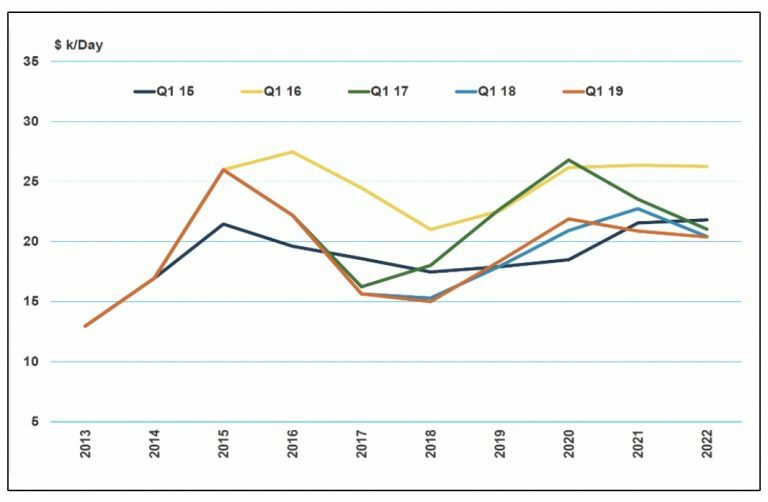 MSI predicts an upturn in T/C rates across the board in 2019, most prominently in the larger tanker segments, which we have slightly amplified in our latest quarterly report. Developments in timecharter markets have, so far, corroborated our view of an overall improvement in market conditions in 2019. This current forecast remains very close to the projections we made at the start of last year. What we expect is suppressed fleet growth and demand support from ‘IMO2020’. The latter event should be supportive in a number of ways. Firstly, this year scrubber retrofits will play a part in reducing the available fleet. Scrubber installations have continued to grow and by mid-February we had on record 535 tankers either ordered with a scrubber or slated for retrofit. In total, Q4 18 saw about 130 additional tankers recorded for scrubber fittings. Although momentum may have slowed on the ordering uptake seen earlier in 2018, actual scrubber fittings will now continue to increase. Whilst some vessels will see their scrubber retrofits take place during a vessel’s natural dry docking cycle, the majority of ships slated for retrofit will temporarily leave the fleet and would otherwise not have done so. As such, the available fleet will be squeezed. The biggest impact will be in 2019, as shown in Table 1, where the total fleet is expected to see a -0.3% reduction. More retrofits will take place in 2020, but those removed in 2019 will need to be added back in the following year to account for their reintroduction, and as such the fleet impact in 2020 will be positive. We have applied an average of one-month duration per retrofit. In January 2019, two VLCCs – DHT Lake and DHT Raven – were tracked using vessel tracking data docking at a Chinese yard. The time spent for a retrofit corroborated this time estimation. Alongside the retrofit activity, increases in temporary floating storage are expected to occur in relation to IMO 2020, with vessels anticipated to be used at some ports that lack sufficient bunkering storage capacity for multiple types of bunkers. This will in turn add to the dampening effect on the available fleet. Accordingly, our repair and miscellaneous removals calculations, which include temporary floating storage and events such as scrubber retrofits alongside ‘normal’ repair are forecast to rise 25% yoy in 2019 to 15.3m dwt, and will hold at similar levels in 2020. This reduction in effective supply is illustrated in Chart 2, which displays the growth rate of capacity in the fleet versus what is available for active trading. The effective capacity of the fleet will grow at a lower rate of 1.8% in 2019 versus 2.2% for the fleet as a whole, as scrubber retrofits and increased floating storage leave fewer ships active for trading. In 2020 we see effective fleet growth return to being higher than total capacity as the majority of ships going for retrofit are returned to the fleet. So, from a fleet-side perspective, IMO 2020 should provide a short-term boost but also influential and highly uncertain is the impact of scrapping volumes. Scrapping presents an inherent dilemma: higher scrapping is incorporated in the MSI forecast and supports improved earnings, but assuming this improvement, why would owners scrap? Our view is that an ageing fleet profile will force huge swathes of tonnage from the fleet over the next five years, and over the next decade the volume of tanker tonnage removed will be massive as the delivery booms of the mid-2000s are phased out. This wave of demolitions is inevitable, even if precisely when it will occur is uncertain. If anything, our forecast over this lengthy period of time is too conservative given preferences for modern tonnage, upcoming regulatory hurdles and developing fleet age profiles. This dynamic will provide substantial long-term support to the tanker market. A recent study by MSI looked at the effects of an extreme reduction in global carbon-based fuel use and the associated impact on long-term supply/demand fundamentals. The study found that a substantial reduction in seaborne oil trade (assuming declining global oil demand) over a 20-year horizon – while clearly detrimental to earnings – would still be far from catastrophic given the amount of tonnage that needs to be removed from the market. Notably, this also supports MSI’s long-term positive view of tanker earnings, despite a slow-down in demand growth.